TRAMS STOP HERE: USA LRT - Baltimore, Md. Outbound approaching Milton, Oct. 12, 1997. Baltimore once was home to a vast streetcar network, with a diverse fleet including PCCs, Peter Witts, articulated deck-roofed cars and large numbers of durable Brill semi-convertibles. 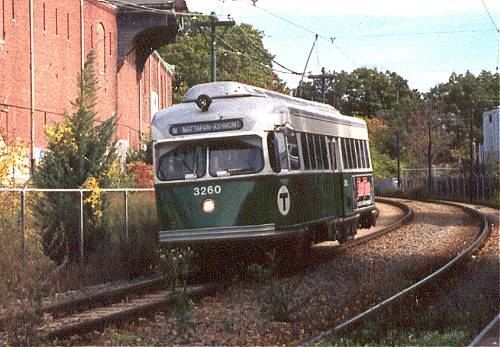 PCCs rang down the curtain on the original streetcar system in November 1963. Rail transit returned to the city 20 years later, with the opening of the Metro heavy rail line in November 1983. The Central Light Rail Line, spiritual descendant of Baltimore's streetcars, opened in 1992. 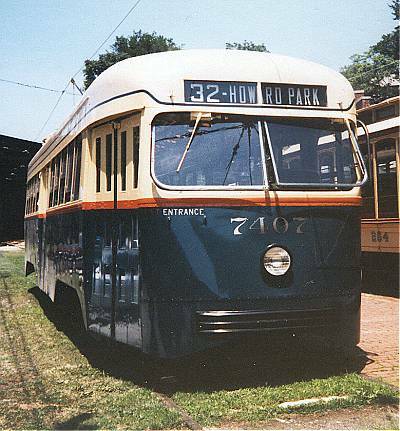 Brilliantly restored, Baltimore Transit PCC 7407 (Pullman-Standard, 1944) is seen at the Baltimore Streetcar Museum, July 11, 1993. Nearly 30 years before, 7407 made history as the last Baltimore streetcar to operate in revenue service. Return to Trams Stop Here!